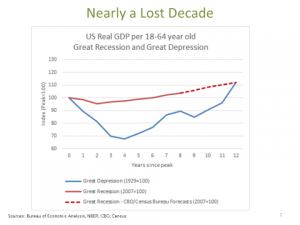 How should we respond to the next recession? That was the topic of an event held by the Brooking’s Hamilton Project where I spoke on Monday in Washington with White House budget director Sean Donovan. I argued a number of points that address issues of current concern. First, I argued that the possible election of “Demagogue Donald” dwarfs congressional dysfunction as a threat to American prosperity. I argued that beyond lunatic and incoherent budget and trade policies Trump would for the first time make political risk of the kind usually discussed in the context of Argentina, China or Russia relevant to the USA. How else to interpret threats to renegotiate debt, prosecute insubordinate publications, and rip up treaties? Creeping fascism as an issue dwarfs macroeconomic policy! Second, I cautioned that while 2009 could have seen a repeat of 1929-1933 and that did not happen there are no grounds for complacency. As the picture below illustrates on current forecasts the economy will have performed as badly over the 2007-2018 period as it did over the Depression 1929-1940 period. The single most important issue for containing government debt burdens, increasing us national security, encouraging more generosity towards the poor and raising middle class standards of living is accelerating US economic growth. Third, I argued — following my secular stagnation thesis — that fiscal policy is now important as a stabilization policy tool in a way that has not been the case since the Depression. 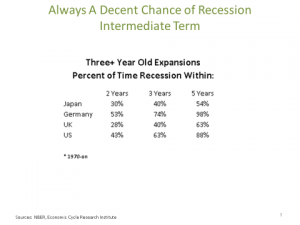 Historical evidence suggests a better than even chance of an officially declared recession in the next three years. 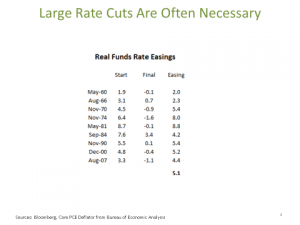 When recessions come, the Federal Reserve normally reduces real rates by four to five percentage points. But there will in all likelihood be nothing like this amount of room when the next recession comes. I say this with full awareness that the Fed has unconventional tools at its disposal in addition to simply lowering rates. But I think it very unlikely that more than 150bps of Fed funds equivalent additional stimulus is feasible. After all rates below minus 50 or 75 bps are impracticable in a society with cash and might actually hurt financial intermediation. 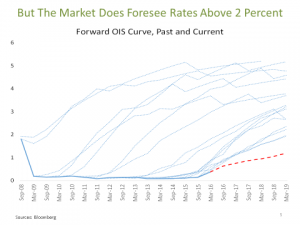 Forward guidance is fine in principle but when the next recession comes expected forward rates will be very low far into the future. And QE is surely already hitting diminishing returns with the yield curve flattening and markets functioning without the illiquidity premia of the early recovery period. “Helicopter money” is basically a form of fiscal policy as I shall argue in a subsequent post and cannot be carried out autonomously by the central bank. There is an additional case for fiscal policy. The economy as it now stands requires remarkably low interest rates to grow adequately. These rates are an invitation to leverage, to reaching for yield, to financial engineering and to bubbles. Raising rates significantly as many suggest without doing anything else risks recession. So the right strategy is to raise demand so as to make financially sustainable growth. This comes back to fiscal policy along with measures like tax, regulatory and immigration reform to spur private demand. Fourth. I suggested a number of areas for expansionary fiscal policy both to make recession less likely and to respond when the next one comes. 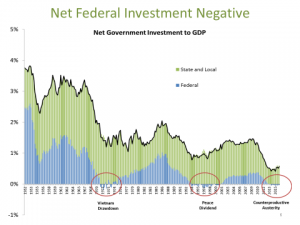 The decline in US infrastructure investment is indefensible in light of recent declines in interest rates, employment opportunities and materials costs. Other areas in which fiscal support seems desirable include housing — where residential investment still lags badly — and support for social security. I referred to the economists argument going back to Paul Samuelson that pay as you go social security can help all generations in a world where growth rates exceed interest rates. Further it raises demand without enlarging government deficits. As I expect to discuss in subsequent posts, much of what economists thought they knew about macroeconomic policy needs to be reassessed in light of events. Just as the events of the 1970s and emergence of stagflation throughout the industrial world, led to new policy paradigms, I believe that recent events will force us to develop new approaches to thinking about economic fluctuations and inflation which will, in turn, drive major changes in thinking about fiscal and monetary policy.